Insulguard > Why Insulguard Insulation? Australia has one of the most diverse climates in the world. Temperatures in Perth can range from −7.2 °C to 50.5 °C (1). In summer it is quite common to have several consecutive days with temperatures over 40°C. Maintaining an acceptable and comfortable temperature range inside the house is essential to reduce thermal stress and promote wellbeing. Thermal stress can lead to dehydration, pneumonia and aggravate any current health problems (2). As the cost of electricity and gas continues to skyrocket, many Australians are looking for ways to reduce their heating and cooling costs as well as reducing their carbon footprint. The most effective methods of reducing heating and cooling costs are to incorporate passive design elements into the design and construction of a structure Incorporating these elements into existing structures is not always financially feasible or possible. In Western Australia, up to 93% of pre 2012 homes do not have wall insulation. The Australian Government now requires the construction of new, or renovation of existing homes, to meet a new six star energy efficiency rating (out of ten stars). One of the key ways to meet this new requirement is through insulation. Poor insulation contributes to heating and cooling systems working harder to maintain an ideal living environment. Efficient building insulation will maintain a thermal barrier that in summer will protect the interior of the structure from being heated, whilst in winter will prevent the interior being cooled. This also allows the heating and cooling systems to work more efficiently, saving money on running costs and prolonging the life of the system. InsulGuard is able to provide quality insulation that can increase a house’s energy efficiency rating. 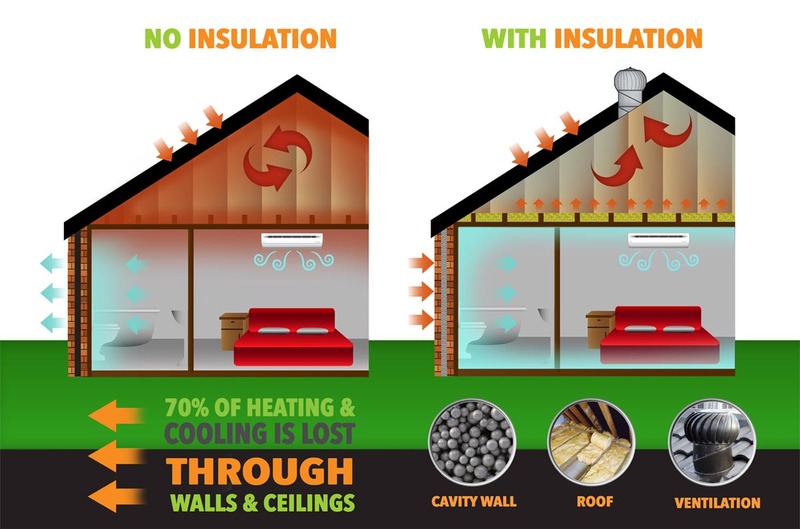 This can be achieved through the use of insulation in a home’s roof and walls. InsulGuard has brought to Australia, and improved upon, a tried and proven technology that has been used in Europe for over 30 years. Cavity Shield insulation is a practical, economical, and efficient insulation. Cavity Shield can be installed in all areas of a building during construction as well as being retrofitted to current structures proving to be a practical and cost effective option. Cavity Shield insulation’s performance lasts the life of the structure and does not deteriorate. It continues to reduce building energy requirements and emissions long into the future. InsulGuard helps achieve domestic sustainability. Sustainability creates and maintains the conditions under which humans and nature can exist in productive harmony, that permit fulfilling the social, economic and other requirements of present and future generations (3). InsulGuard contributes to sustainability by reducing your carbon footprint, decreasing greenhouse gases and creating a more comfortable living environment. (1) Bureau of Meteorology, Australian Government. (2) The Department of Health, Australian Government. (3) United States Environmental Protection Agency.